Spaghettini with Clams and Shrimps. 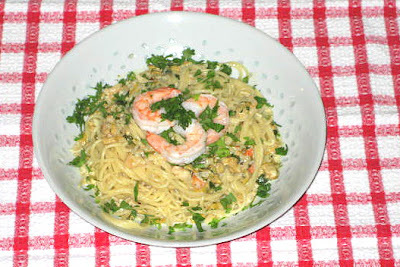 “Spaghettini with Clams and Shrimps in a wine, clam juice and cream sauce and finished with a dash of truffle oil, tarragon and nutmeg”. Basically, that’s the whole recipe and I make it in all seasons even though it does look like a comfort food. 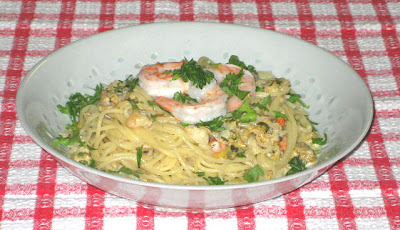 This is my version of “Spaghetti con Vongole”. Start your pot for spaghettini. Heat frying pan and when hot add olive oil and then shallots. Sauté for few minutes but don’t allow to brown. Pour in wine and cook off. Add clam juice and cook till only about 1/4 cup remains. 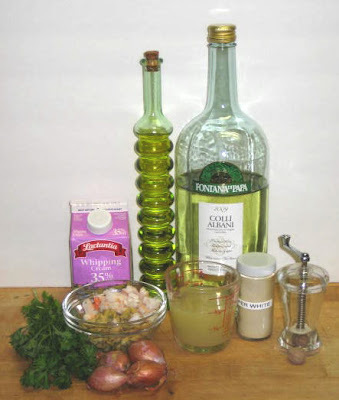 Add clams and shrimps and sauté for about 2 minutes. Add cream and cook under medium heat till sauce starts to thicken. Add parsley, tarragon, nutmeg, white pepper, chili pepper flakes and truffle oil. When spaghettini are cooked al dente, drain and toss with the cream sauce. Serve on preheated plates. I do not grate cheese over seafood pasta but if you want to, go ahead.